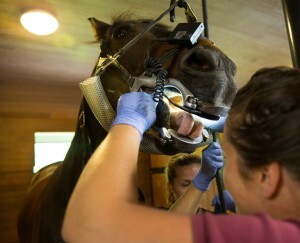 Equine Dentistry is a very important part of every horse’s routine health maintenance program. Annual or even biannual examination of your horse’s teeth allows us to identify and address problem areas before they cause health issues or impair performance. Horses’ teeth are continually erupting throughout their lives, so the horse’s mouth is always changing. Small imbalances can lead to more significant malocclusions if they are not addressed in a timely fashion. We use a variety of hand and power instruments to maintain dental health and to address problems such as hooks, enamel points, wave mouth, step mouth, excessive tartar buildup, periodontal disease, and diastomas. We also treat fractured teeth and/or jaw bones, infected teeth, infected bones or sinuses and oral tumors. Many of these problems can be addressed on the farm as long as proper restraint and comfort of the horse can be achieved. For some of the more involved cases, we may need to admit the horses to the hospital for proper care. The Powerfloat is a very thorough and quick way to do routine floats and to address malocclusions. For the safety of the horse and the operator, all horses undergoing a Powerfloat must be sedated. Some abnormalities may need to be addressed over several sessions that are 4-6 months apart due to concerns of damage due to over heating or exposing the sensitive pulp of the tooth. Proper dental care allows a horse to process its feed and hay in an efficient way, has been shown to play an important role in a horse’s ability to perform well, and certainly is important in improving the lives and longevity of our geriatric patients. We are committed to providing you and your horses with the very best dental care available.